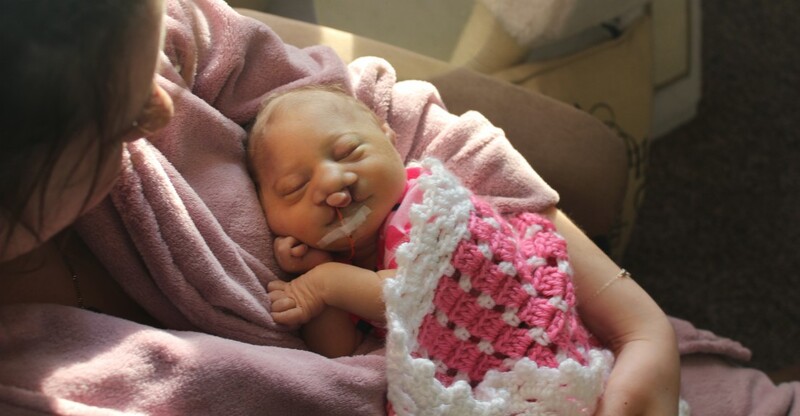 Last year, by no less than a miracle, I was able to spend Mother’s Day with my daughter. That makes this Mother’s Day my first one without her. I have been bombarded by articles in these days leading up to Mother’s Day, seeing titles similar to “Surviving Mother’s Day as a Bereaved Mother” and “Ten Ways to Support a Loss Mom on Mother’s Day.” It has made me wonder if I’m crazy. Am I insane to be excited about Mother’s Day? Perhaps it’s a lack of experience with this holiday after Caroline’s death, but I am excited for the day that celebrates my motherhood. I want to celebrate that my body kept her safe. I want to celebrate the beauty of her birth. I want to celebrate that I fed her. I want to celebrate the diapers I changed for her. I want to celebrate the cuddles and the love. The love that didn’t end with her death. Caroline has completely changed my life. Everything I do is an attempt to make her proud of her mom down on earth. I am her mother every day, nurturing her memory and loving her. That is something that should be celebrated. I am an amazing mom. Is it beyond hard to face life without her in my arms every day? Absolutely, but I am proud of the mother that I have become. I hope Caroline is proud of me too. Happy Mother’s Day to all of the moms with empty arms. You have just as much of a right to celebrate your motherhood this weekend as the moms with their arms full. Arguably, more of a right. Stand proud and remember that you face the impossible every single day, and your motherhood always shines. Your love for your children is an unstoppable positive force unleashed on the world. You and your motherly love deserve to be celebrated. Categories: Identity | Tags: baby loss, infant loss, mother, Mother's Day | Permalink. 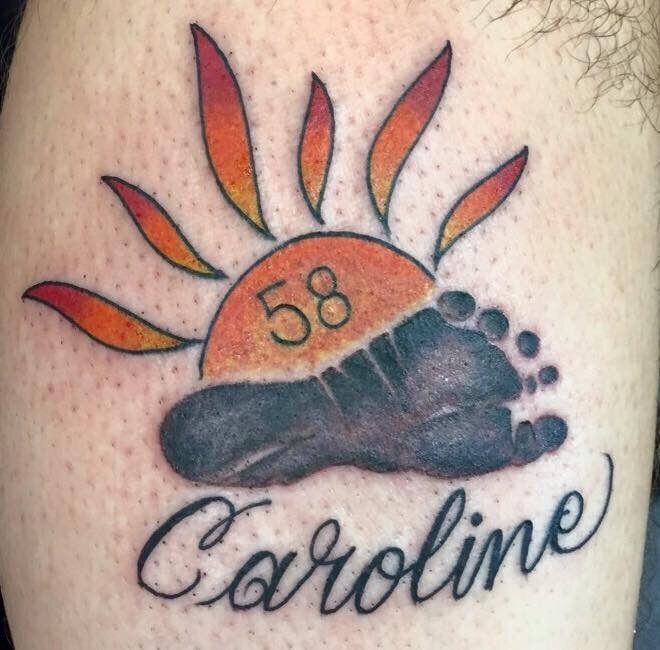 My husband spent months deciding on the perfect design for his tattoo in memory of Caroline, and he got it this week! He absolutely loves it and so do I! It is on his outer right calf, clearly visible when he wears shorts. It is his first tattoo, and he chose a design for our very special little girl. Caroline’s footprint is the actual size of her footprint at birth. The sun is something we associate with Caroline; she loved being out in the sunshine. The 58 is because she lived for 58 days. We are so thankful for all of that unexpected time. There are six flames off of the sun for her six beautiful fingers on each hand. While I have been able to wear necklaces in memory of Caroline, my husband has not had that opportunity. He is not a necklace-wearing-type of guy. This has been hard for a dad who is hurting just as much as I am. He misses Caroline so much and is so proud of her. Now he has a way to show the world that he is the father of an incredible little girl. Caroline is so loved by her daddy! Categories: Identity | Tags: bereaved dad, child loss, love, sunshine, tattoo | Permalink. Yesterday, I gave a talk in front of all of my mentors and colleagues about my research. This is the first time that I’ve been in front of them in this way since just before Caroline was diagnosed. It is traditional to share acknowledgements at the end of a talk like this. I included a thank you for my funding and people who have helped with the project. I also included Caroline. I made a decision to say her name. I have been underwhelmed by the support I’ve gotten at work. There have been a few who have gone out of their way to be there for me and who do not shy away from talking about Caroline, but most have acted as if nothing has changed. I came back to work without my baby and everything has changed, but I do realize that my world was the one that was rocked. I think about her every second of every day, but many have probably already forgotten about my baby. But not yesterday. I said her name. I took the opportunity to thank those who had been there for me during a very difficult year. Maybe it was inappropriate, but I decided that I did not care. I realized that if I don’t show that I want to talk about Caroline, no one ever will. That is just about the worst thing I can imagine in the coming years, so I acknowledged the girl who is always with me, guiding the person that I have become. Categories: Grief, Identity, Support | Tags: love, name, talk | Permalink.